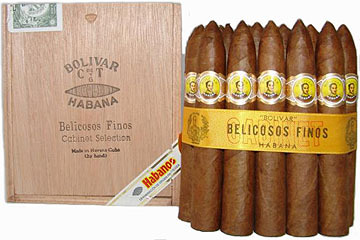 Indispensable in every Connoisseurs humidor, its our favourite Belicoso (Campana). Before Lighting up: Spicy and earthy, with a salty taste on lips. Burning: Earthy and spicy notes are dominant without being overpowering. In the second third, the smoke becomes more rich and complex with a shadow of a black honey taste. Final: The Bolivar Belicoso has an exquisite final. The full earthiness is combined with unsettled Cuban cedar notes, and a powerful dark pepper taste. The final may be slightly overwhelming for a beginner. Price: POA - 25 sticks in a box. We will try and beat any written quote.